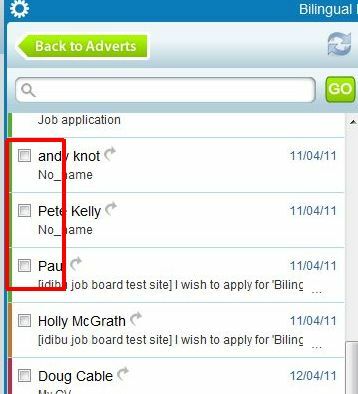 Having sorted your candidates into groups, you may now respond to them as required. As well as sending autoresponders, you may feel the need to send a custom email to any of your applicants. You can do this directly from Aptrack, and also save each individual email as a template for future use. Multiple candidates can be emailed together, and it's a great option for adding a more personal response, should it be required. You may send custom emails to candidates on an individual or a group basis. Just use the check boxes on the left to specify the recipients of the email. Please note: Do not check the box to the right, as you will change the default action. Just click on the 'Reply-Custom email' caption. You will now see the following email template displayed on the screen. Notice the list of candidates (if more than one). Please note; multiple candidates will not see the recipient list on receipt of the email. You also have the option to save any custom email as a template for future use if required. Before sending, click on the 'Templates' drop down menu at the top of the email message area. Type the name of your template here, and click the green plus icon. will be displayed, just click to open. When you are happy with your email, just click Send. The email will now be sent to all recipients.